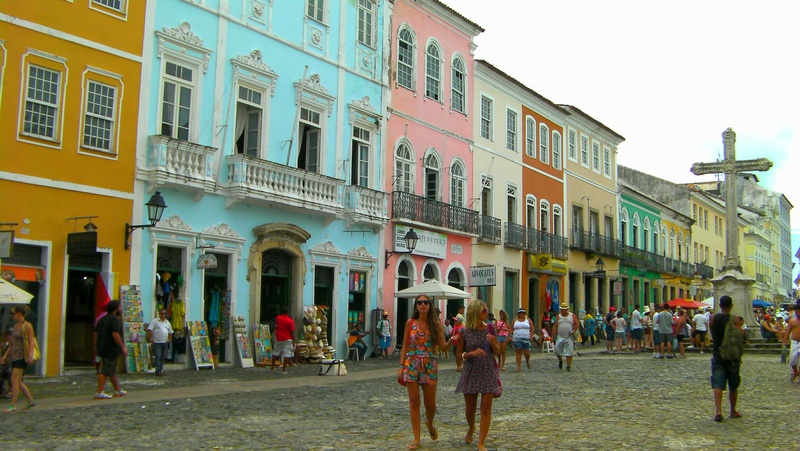 Salvador da Bahia is the oldest city in Brazil and a colonial and cultural gem for modern day visitors. 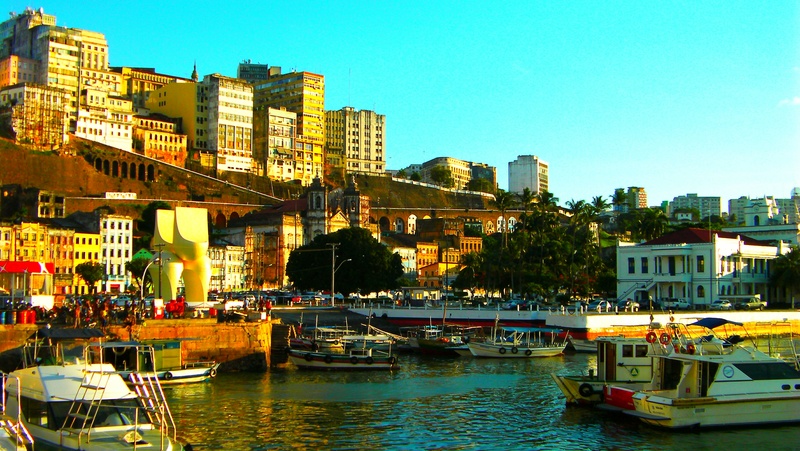 The City was founded by the Portuguese 500 years ago and soon became their most important and strategic overseas colony. Sailing through Bahia de Todos os Santos (All Saints Bay) to the port of Salvador, slaves arrived in their droves, brought to work the sugar plantations and mine for precious stones to build this new country and establish Brazil’s first capital. 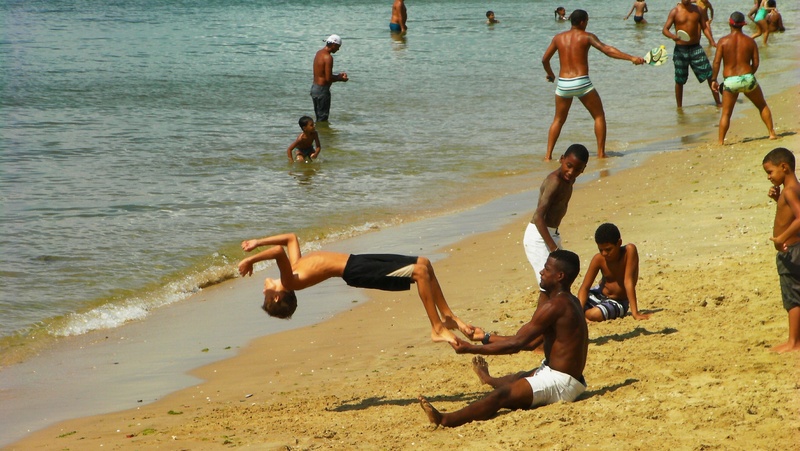 Today the city is still known as the African heart of Brazil. Decendents of slaves have succeeded in preserving their heritage and culture more than anywhere else in the world outside of the African continent, and the City’s rich history, tradition and folklore captivate visitor imaginations. The city has a wealth of attractions and sights for tourists who pile in by the coachload but this is no Disneyland. Take a closer look and you’ll quickly notice this city is a working, living, breathing (and occasionally grimy) space that locals are proud to call home. Around every corner, the city oozes with life and vitality, with vendors pulling wooden carts piled high with fresh fruit, children playing football in the streets, women hanging out their washing and the smell of spicy African cooking wafting through open doors. Long after you’ve seen all of the guidebook’s highlights, the city still has more to give. 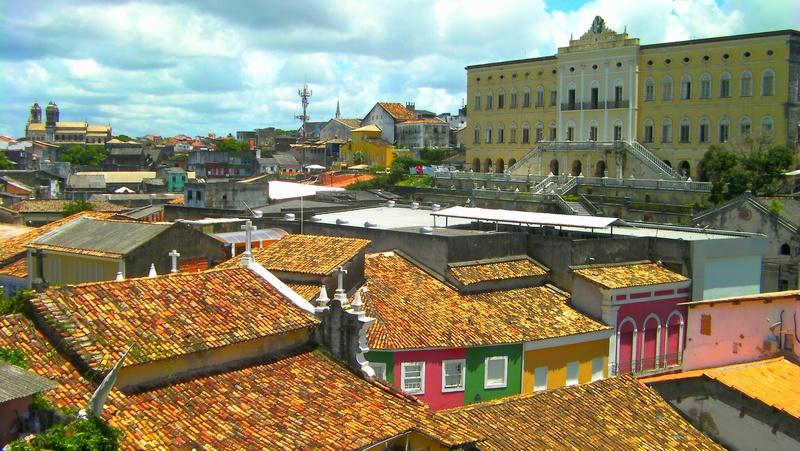 The UNESCO World Heritage Listed old town known as the Pelourinho is a fairytale of cobblestoned streets, brightly painted buildings, and ornate colonial churches. This historic neighborhood is where slaves were bought and sold and its name Pelourinho, translates as whipping post, another harsh reminder of the city’s dark past. Thanks to UNESCO funding, a huge restoration project began in 1993 and is still very much underway. 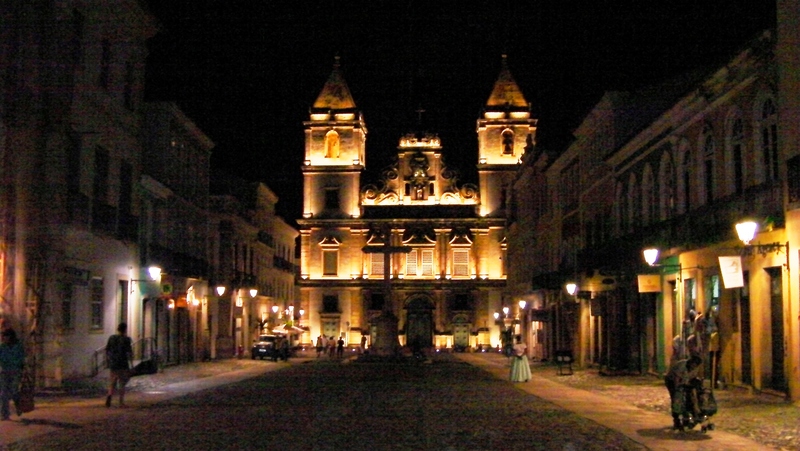 The old town’s streets are linked by beautiful open plazas. Surrounded with grand houses painted in pastels, lavish theatres and decadent churches, they are great places to linger and watch the world go by. Vendors sell fresh coffee and ice-cream to tourists who perch on the edge of fountains and under palm trees to catch their breath. Entertainers gather in the plazas so be prepared for music, dance and acrobatics, even when you weren’t looking for it. 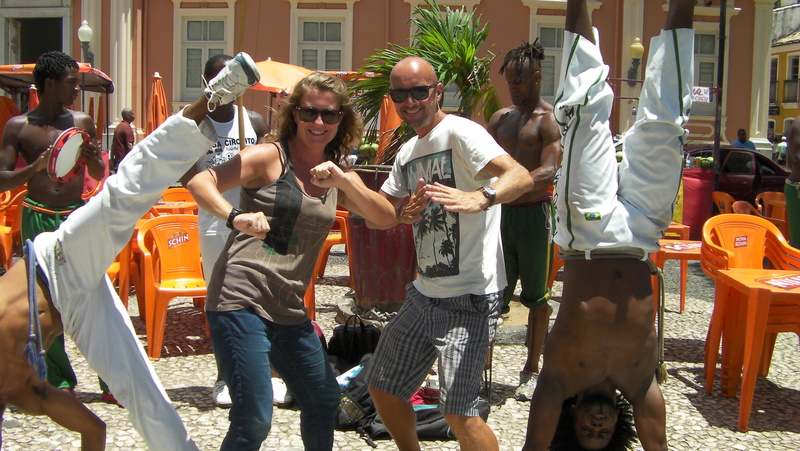 We were accosted by a group demonstrating the popular Afro-Brazilian martial art of capoeira. As the group performed their graceful ritual of kicks, flips and spins to music, we couldn’t resist the temptation to join them. To gain a different perspective on the old town, find a high point and look out across terracotta tiled roofs punctuated by church towers and magnificently grand buildings. You are literally walking through history as these views haven’t changed for hundreds of years. For a refreshing thirst quencher, fresh coconuts can be found stacked high all over the city and vendors dexterously use machetes to carve a neat hole in the top for a straw – a very worthwhile interlude in a hot and steamy city. The beautiful Art Deco Elevador Lacerda connects the upper city, Cidade Alta, and lower city, Cidade Baixa. From the top there are magnificent views out across the turquoise waters of the Bay of All Saints while at the bottom the bustling Mercado Modelo, housed in the old Customs House, sells a wide range of traditional arts and crafts. The clunking and groaning of the original iron structure was replaced in 1928 by a state of the art electric version and nowadays four elevators move around 50,000 people on a daily basis, saving them the calf busting hike up and down hill. 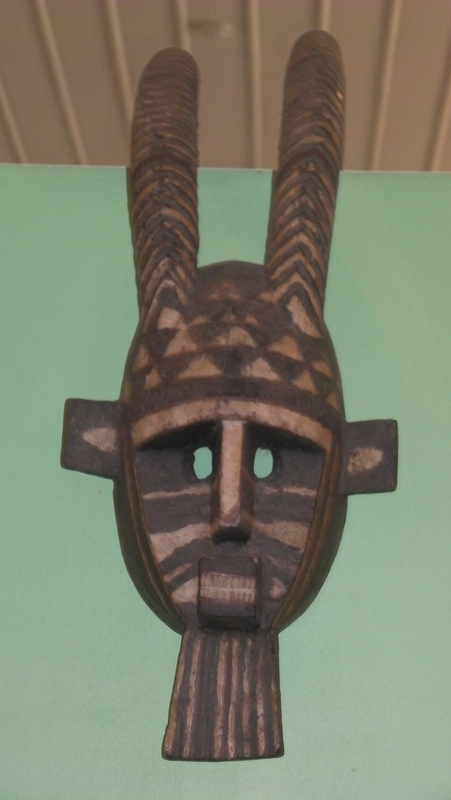 Bringing the region’s history and culture to life the Afro-Brazilian Museum and the Archaeology and Ethnology Museum, conveniently located in the same building, are worth dropping by, even if you’re not a big museum fan. 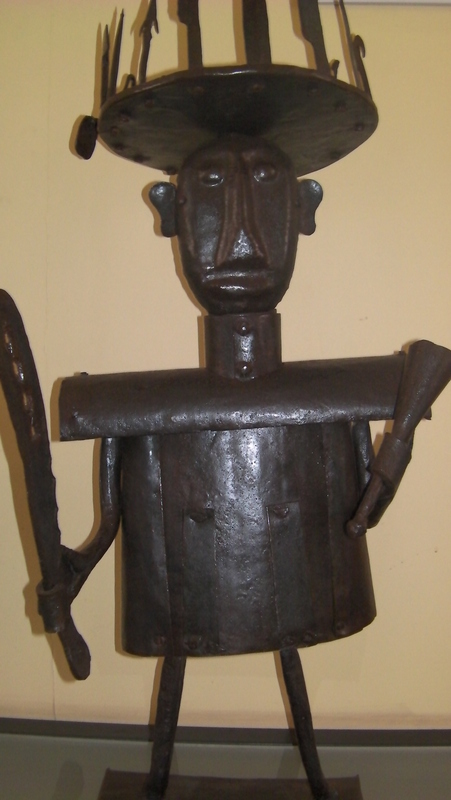 They have a fabulous collection of intricately carved wood panels depicting Candomblé spirits, wooden masks, traditional dress, sculptures, pottery and artwork. 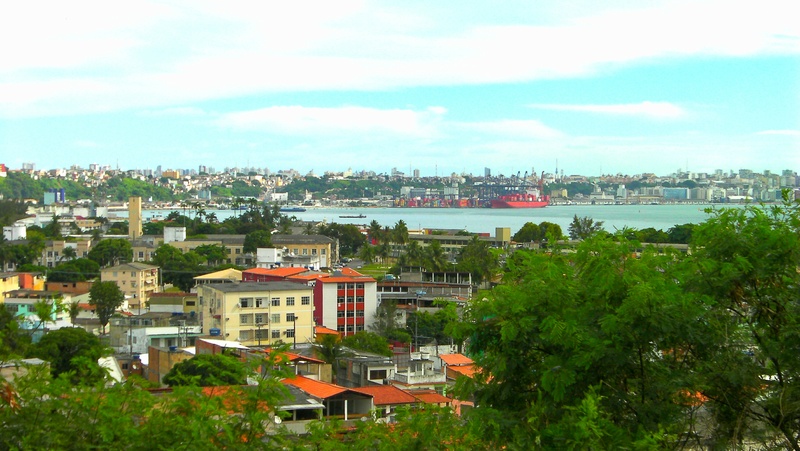 The realness of the city is part of its charm but it means poverty and crime can be an issue in Salvador, as with many of Brazil’s larger cities. Keep your wits about you, especially after dark when certain areas can feel a little seedy. Most people will leave with just a small dent in their wallets from a donation to a street performance or giving some change to a beggar but take precautions not to be a victim of more serious crimes. 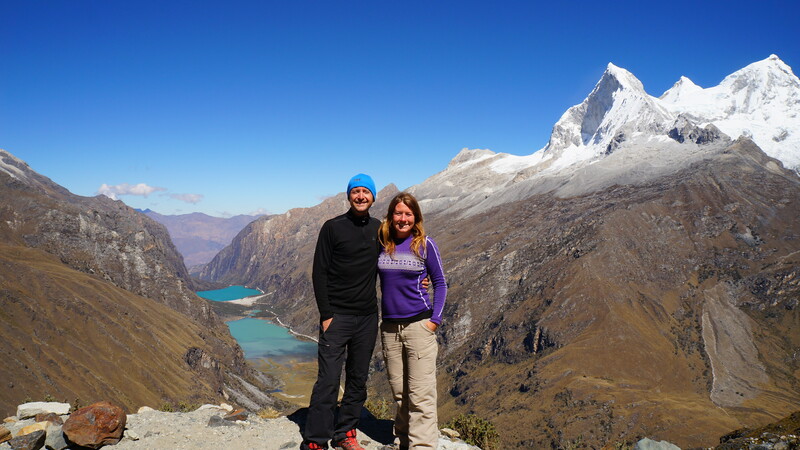 It’s not uncommon to hear locals boasting they have a church for every day of the year. 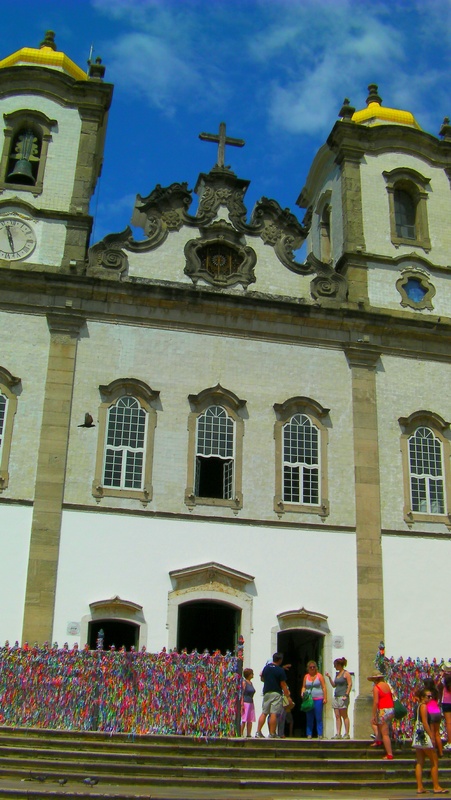 In reality there is close to one hundred churches, however, they are some of the most beautiful examples of colonial architecture in Brazil. Often a church’s humble exterior will not prepare you for the opulence displayed inside. Glittering chandeliers, ornate wooden carvings, pillars of marble, hand crafted tiles, solid silver candlesticks and friezes smothered in gold leaf are a reminder of Portugal’s wealth and power during the colonial period. Look up and you’ll notice that several of Salvador’s churches seem to be unfinished with whole towers missing in some cases, however, this was intentional so that owners could avoid paying a tax on completed buildings. Another quirky attribute if you look hard are disfigured angles, ugly cherubs and distorted paintings created by the slaves to get their own back on masters who forced them to abandon their own beliefs and build these places of worship. 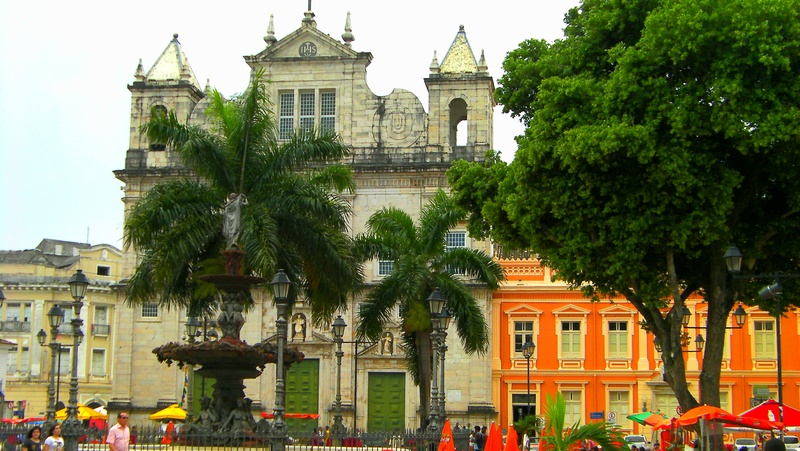 Salvador’s churches are a beautiful, fascinating slice of history, but they are also much more than a museum. Blessing Tuesday (Terça da Bênção) takes place every week in the Pelourinho and although focused at the São Francisco Church and Convent, the activities spill out onto the surrounding streets in a riot of colour and sound as people demonstrate their devotion with singing, clapping and dancing. 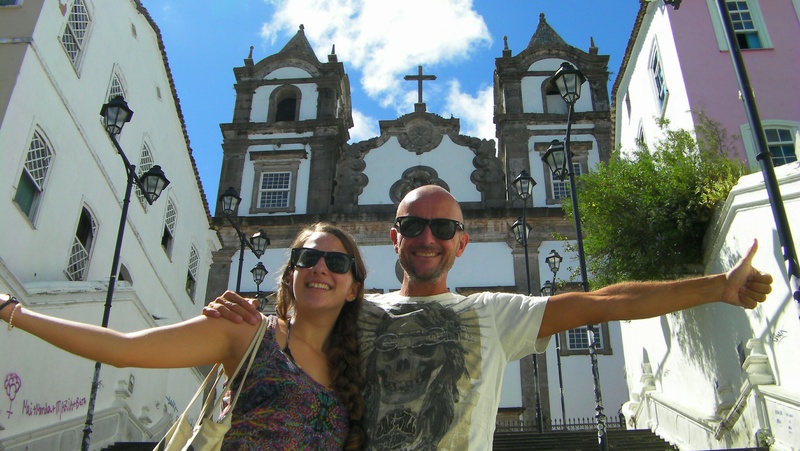 Perhaps the most famous church in all of Bahia is the Igreja do Bonfim, renowned for its miracle cures. People come from far and wide to pray for sick loved ones and their own rejuvenation. 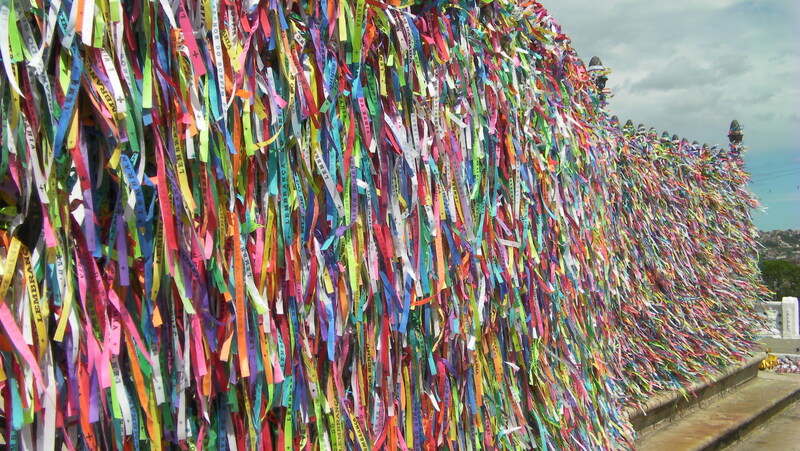 The gates outside of the church are decorated with colourful ribbons. Believers make three wishes as they tie the ribbons in three knots around the gates and around their wrists and must not remove them until their wish is granted. Inside the church one room known as the Sala dos Milagres (Room of Miracles), believers light candles, write letters and leave pictures of loved ones in need of divine intervention. Most bizarrely, replicas of body parts hang from the ceilings, a testimony to scores of thankful individuals whose medical conditions have been healed by the power of prayer. 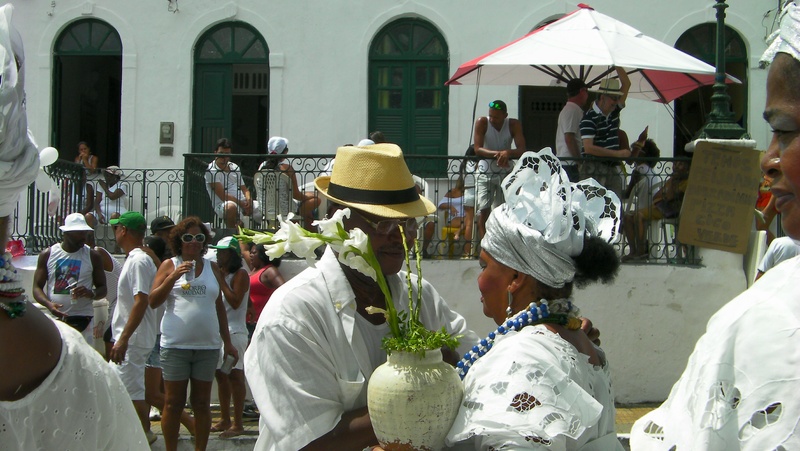 Despite the high number of catholic colonial churches, a fervent devotion to Candomble, an ancient form of spirit worship brought from Africa, is Salvador’s most influential religious power. 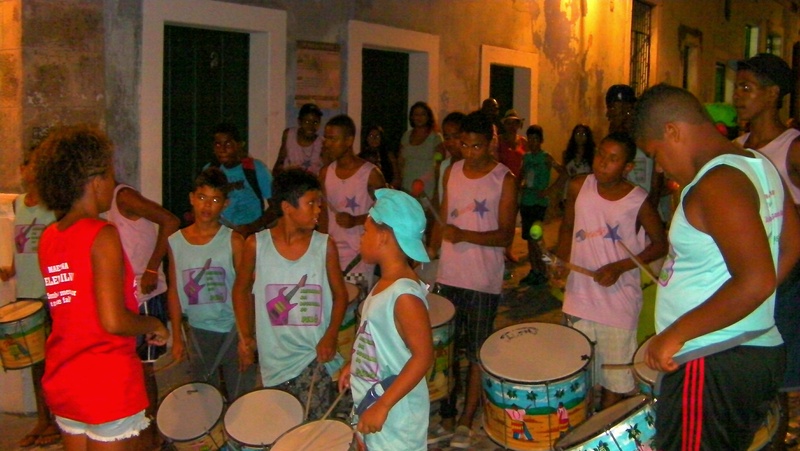 Ceremonies involving music and dance plus offerings to appease spirits are common place throughout Bahia. Tourists are encouraged to visit Bahian temples to experience Candomblé ceremonies but this is no tourist show (even though a fee is paid for participation) and visitors are expected to be respectful. Slaves were forbidden to practice the Candomblé religion so used Catholic Saints and symbols to represent their own gods and continued to follow their own religion in secret. Nowadays, an interesting fusion of these religions still exists and is openly celebrated in the vibrant festival ‘Lavagem do Bonfim’, where Catholic priests and Candomble priestesses join together in a symbolic washing of the church’s steps whilst worshippers fill the streets with a party vibe. With thousands of miles of coastline, it’s not surprising beach culture runs through the blood of Brazilians. Even though Salvador is one of Brazil’s biggest cities, locals and tourists still find time to hit the beach, albeit they have to work a little harder to find a deserted stretch. Upscale and decidedly touristy, the neighbourhood of Barra, just 5 kilometres from the old town, offers modern apartment style accommodation, boutique shopping malls, good restaurants and sandy beaches. 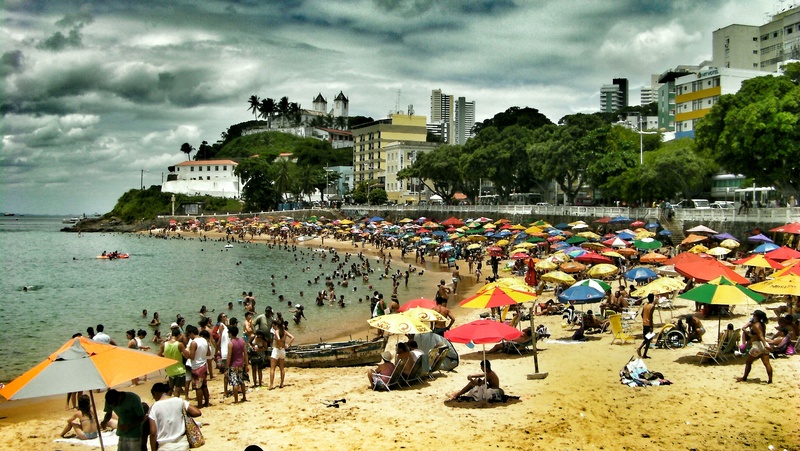 The main beach Praia Porto da Barra is nearly always packed with sun loungers, young kids running wildly into the sea and vendors selling their wares. There’s hardly an inch of sand to call your own so don’t imagine a relaxing experience but it’s a great spot to hang out and people watch. 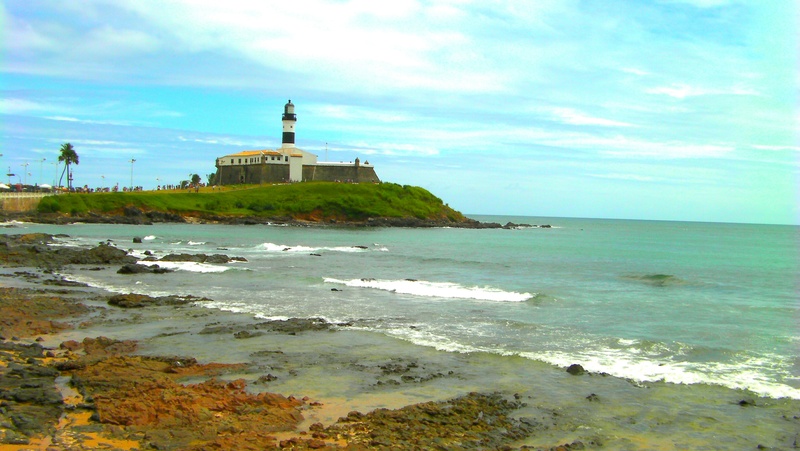 Barra also offers the chance to see up-close some of Salvador’s impressive colonial forts used to defend the city limits, the oldest and grandest of which is Forte de Santo Antonia da Barra. 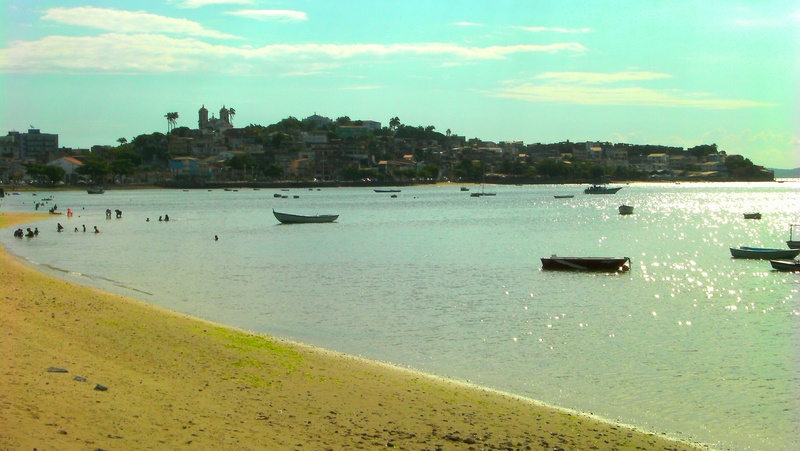 If you’re looking for a more local and charming experience, the sheltered bay at Praia da Ribeira is a great option. The tumbledown houses built into the side of the hills and calm water actually makes for a rather picturesque backdrop and the scene could almost be mistaken for a Mediterranean village. 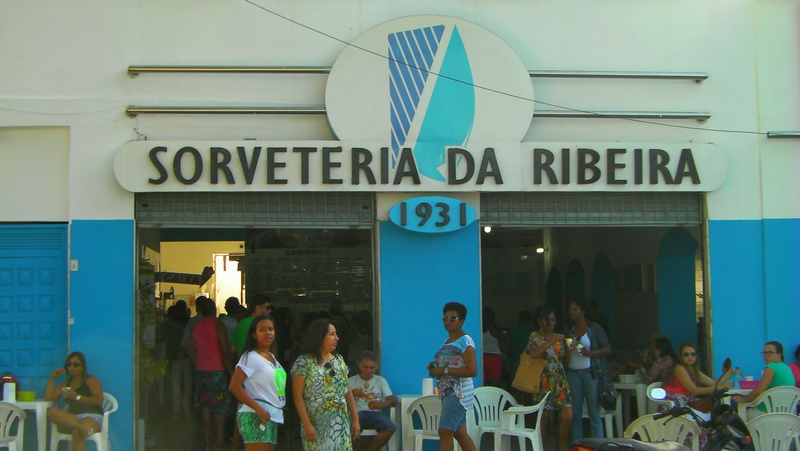 The Ribeira promenade is lined with quaint bars, and restaurants serving local cuisine. 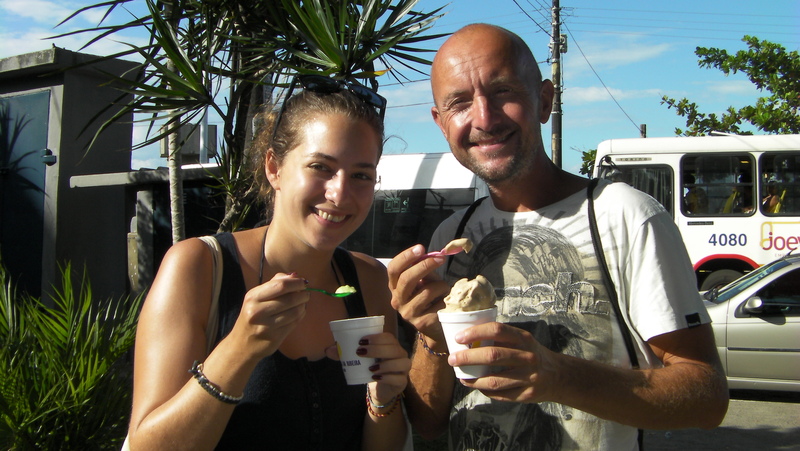 Don’t leave without visiting one of Salvador’s culinary institutions, Sorveteria da Ribeira, to sample delicious and inventive ice-cream. As the sun starts to set, candle-lit tables appear on the cobblestones of historic Pelourinho and along the waterfront at Barra. Groups gather to share an early evening beer in beautiful surroundings. 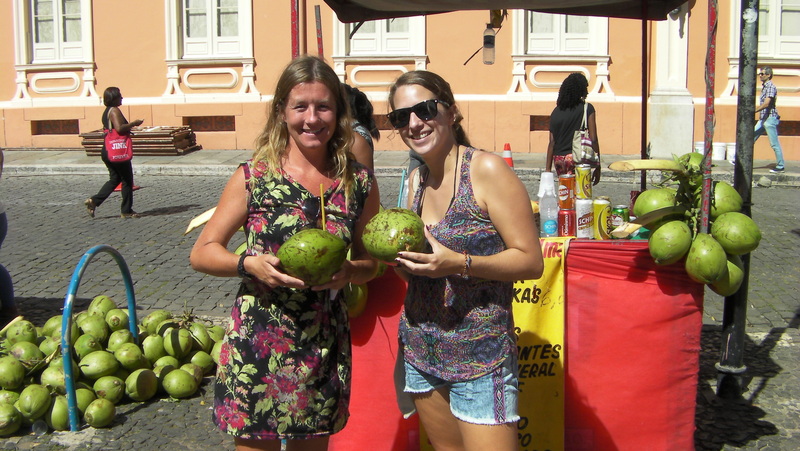 As with most things in Bahia, regional cuisine is inspired by the City’s African roots, with dishes promising rich flavours and beautiful spices. 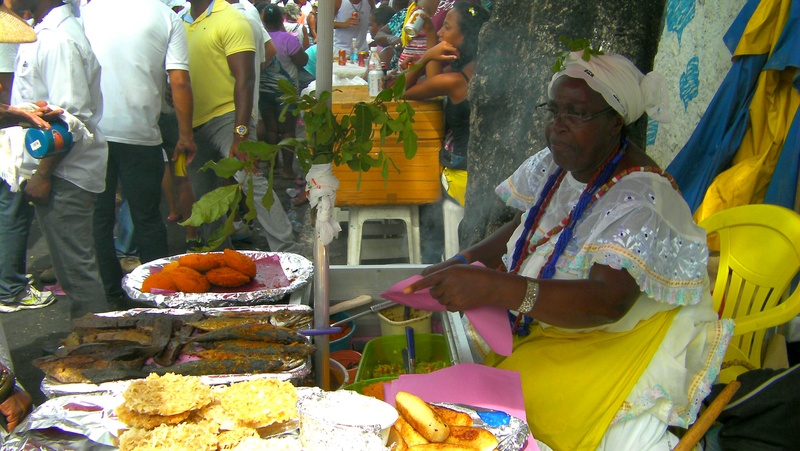 A great choice of inexpensive street stalls run by Baianas, women usually dressed in white with their hair wrapped in turbans, serve traditional food such as ‘Moqueca’ (seafood stew rich in flavours like coriander, coconut and tomato) and ‘Acarajé’ (deep-fried black-eyed-pea cakes stuffed with prawns, coconut and ground peanuts). A good smattering of upmarket restaurants offer modern takes on classics served in chic surroundings. To submerge yourself in even more culture, find time to see the incredible Bale Folclorico da Bahia Teatro Miguel Santana in Pelourinho. 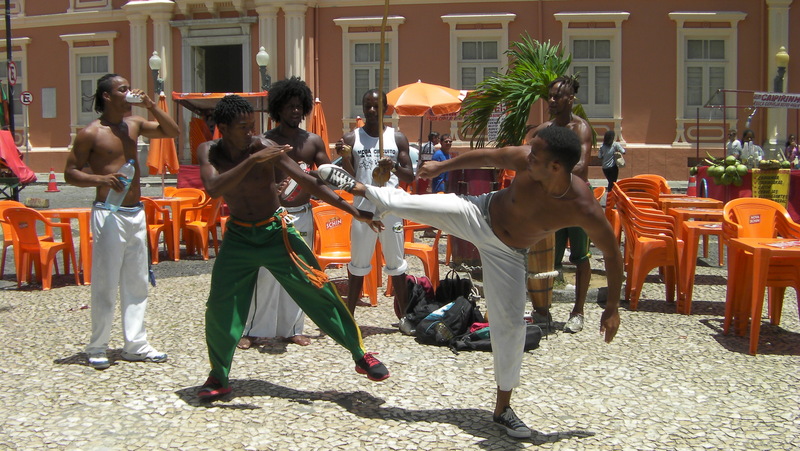 The hour long performances, filled with traditional dance and capoeira, are shown every night of the week (except Tuesdays and Sundays) at 8.00 pm. Purchase tickets in advance of the show (R$40 and half price for students). As the night progresses, music fills the air. Most bars and restaurants have live performances at least once a week and sometimes more, so expect to hear a mix of reggae, pop, rock, samba, tropicalismo and much more. 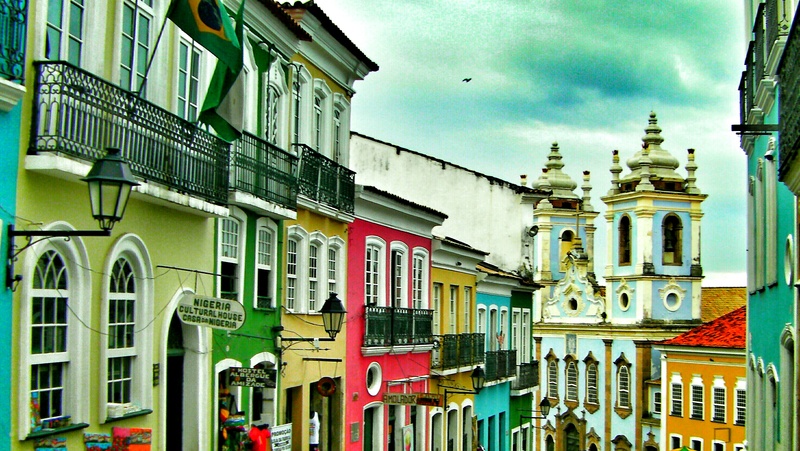 Unlike in Rio or São Paulo, you won’t find a hip or dressy party scene here. Instead Salvador’s vibe is very relaxed and unpretentious. Considered to be at the heart of Brazil’s music scene, the Country’s most talented artists can be enjoyed playing locally in rustic bars. As the night gets lively be sure to try Cachaça, the national drink of Brazil, made from distilled sugar cane, and best served in a Caipirinha cocktail with sugar and lime juice. 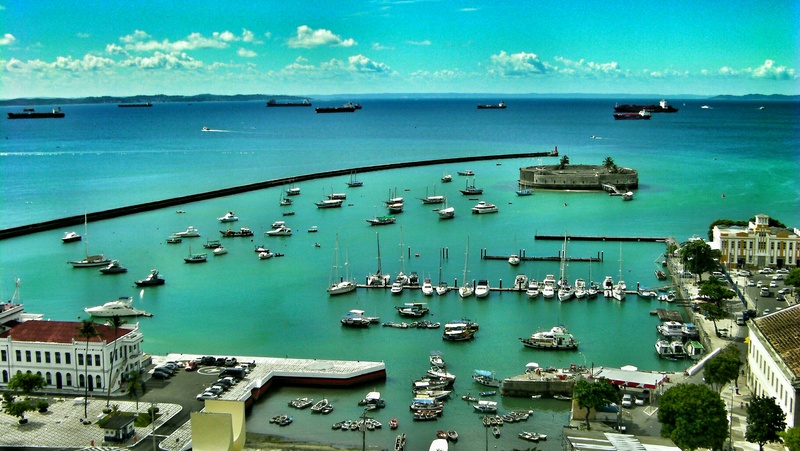 And with your glass full to the brim, raise a toast to “Salvador da Bahia” a city that has been dubbed “the land of happiness” for its smiling carefree spirit, its intoxicating real-life buzz, it’s ‘take me as I come’ beauty, and its high energy lifestyle.